“Sol Latino” Spanish School where you will find all of this and much more! The school is located in the historic center of the beautiful city, Quetzaltenango, Guatemala in Central America. The Spanish school “Sol Latino” was founded in order to provide students with the highest quality full immersion Spanish language and culture program. Our philosophy is centered on offering students an individualized method of learning. This is why we have developed 10 different levels of Spanish language courses and study programs of a wide variety, including D.E.L.E. Preparation courses, which can be designed specifically in accordance with the knowledge, abilities, and existing needs of each student. Our method is one-on-one: one teacher with one student. In each class an extensive range of educational methods will be used, as we gradually introduce the Spanish grammar for the best advancement of the language. This is done in a fast, efficient and interesting way, in a calm, pleasant and comfortable atmosphere. 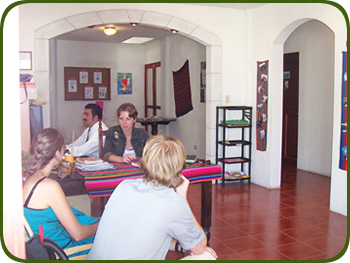 Our instructors are highly skilled and experienced in teaching the Spanish language. 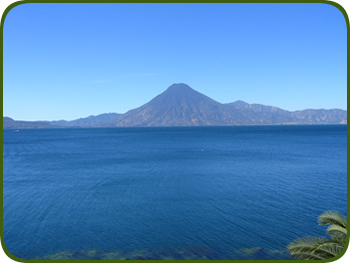 They possess a wealth of knowledge about politics, culture, economy, religion, history, and many other areas of interest about Guatemala and Latin America. Our complete immersion program offers you the opportunity to live with a Guatemalan family that has been carefully selected and enabled to host students with a variety of needs and dietary requirements. With the family, you will find a friendly and comfortable atmosphere where you will be able to enjoy the rich and beautiful Guatemalan culture. In addition, it is an excellent opportunity to practice your Spanish outside of class. If you prefer another type of housing “Sol Latino” also offers you the opportunity to live in our student guesthouse “Casa Latina”. As part of the complete immersion process the school organizes daily activities in addition to regularly scheduled class hours. We offer cultural, historical, educational, recreational and sports activities, social projects, and short hikes, to name a few. 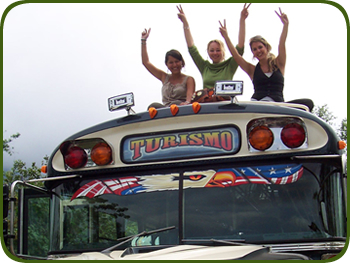 We also organize excursions on the weekends to the most attractive places in the region with experienced guides, like volcanoes, lagoons, lakes, mountains, beaches, hot springs, spas, and others, where aside from getting to know the natural beauty and culture of Guatemala, you will meet descendants of the Mayas and share in a relaxed atmosphere with other students. 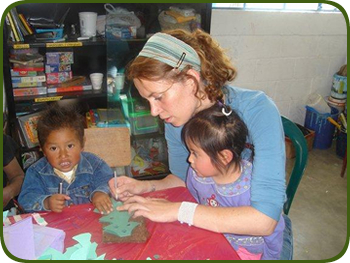 Another purpose of the “Sol Latino” Spanish School is to promote, encourage and support social organizations. For this reason we have ties with different organizations in the region with which we have worked and that we continue to support; a part of your weekly tuition is used to support these organizations. We also offer the opportunity for you to volunteer. We can help you find a project that suits your abilities and interests. We have various complete immersion packages for the best prices in the region! A total immersion program in the Spanish language and Latin culture, while promoting and encouraging the development and support of social organizations in the area. An individualized learning program based on the knowledge, abilities and needs of the student. 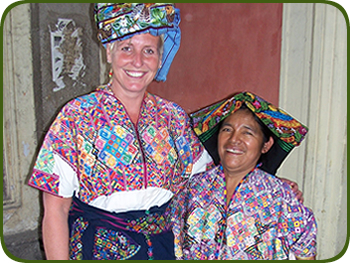 Live with a Guatemalan family; in our guesthouse “Casa Latina;” or other living arrangements. Cultural, educational, recreational and sports activities, and social projects. Weekend excursions to the most attractive places in the region, such as volcanoes, mountains, beaches, lakes, lagoons, ruins, hot springs and saunas. The possibility to support local social projects. Opportunities to work as a volunteer. If you would like more information please contact us and we would be happy to answer any questions.